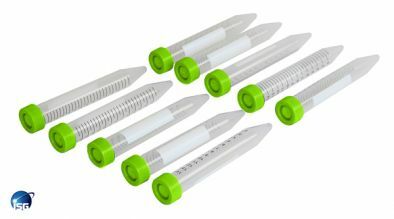 The ISG® 15ml conical bottom sterile centrifuge tubes and supplied in foam racks of 50 tubes for easy storage. They are made from ultra-clear polypropylene to ensure clear vision of samples. The cap is made from HDPE (High Density Polyethylene) and has an excellent leakproof seal. The tubes have black graduations with a white marking strip for labelling.